What about cis and trans fats? The carbon-carbon double bonds along the hydrocarbon chain of fatty acids can be either the cis or trans isomers. 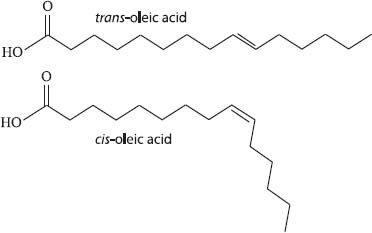 Naturally occurring unsaturated fats have more cis fats, while manmade fats (like margarine) have a higher level of trans fats. Trans unsaturated fats turn out to be particularly bad for humans as they increase cholesterol, leading to heart disease.